The race to become the 2011 Abu Dhabi Desert Challenge cars champion took another twist today (April 6) as Team X-Raid’s Stéphane Peterhansel (France) regained the top spot from teammate Leonid Novitskiy (Russia) on Leg 4. An impressive third-place for Yahya Bel Helei saw the UAE driver strengthen his overall position, giving him a good chance of moving up the rankings tomorrow. Meanwhile, Spanish world champion Marc Coma retained first place in the overall bike class, despite 21-year-old Dubai-based Sam Sunderland recording another spectacular leg victory. Today’s Nissan stage was the longest and toughest of this year’s rally, pitting riders and drivers against 350 kilometres of demanding Western Region desert. But it didn’t stop Emirati Mohammed Al Shamsi from remaining on top in the quads class overall, despite being beaten to the finish line on the day by compatriot Atif Al Zarouni. In the car category, Peterhansel reasserted himself as the dominant force of this year’s rally by retaking first place overall from his X-Raid teammate. For most of the day, it looked like the leg could go either way, but on the closing run-in, Peterhansel upped the ante in his Mini All4 Racing car, eventually finishing 19m 16s ahead of Novitskiy’s BMW X3 CC, which was enough to put him back on top of the overall standings. Not far behind the X-Raid duo on the day was the UAE’s Bel Helei, who asserted his position as fifth in the overall standings by finishing today’s leg in third in his Isuzu, 1m 27s ahead of the Schlesser Original dune buggy of veteran racer Jean-Louis Schelesser, who holds onto his third place overall. In the bikes, the day began with Coma looking favourite for another stage win, sailing past the first two checkpoints in good time. 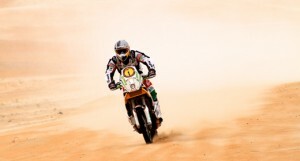 However, British Desert Challenge debutant Sunderland, who took a surprise victory on stage two of the race, outshone his more experienced KTM-UAE Rally Team colleague once again to finish more than 28 minutes ahead of the Spaniard. Sunderland currently sits in 34th place in the overall table, having been penalised for a severe mechanical setback on Leg 3. Portuguese rider Helder Rodrigues is chasing Coma hard, and today closed the overall gap with the defending champion to just 3m 22s, while Jakub Przygonski of Poland sits in 3rd place on his KTM 450. Another Pole, Marek Dabrowski, in 9th place overall, leads the Open Production Class where UAE-resident Tim Trenker is in third place. 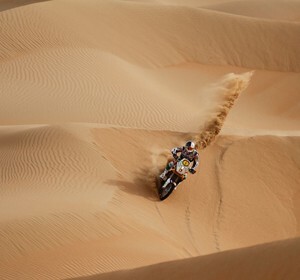 The quads provided even more excitement for Emirati rally fans, with two UAE-nationals battling it out over the Al Gharbia dunes for first place. In the end, it was Al Zarouni who prevailed on the day with a time of 6h 3m 5s, just under five minutes ahead of Al Shamsi, who managed to retain his lead in the overall standings. However, it was not all good news for Emirati entrants at this year’s Abu Dhabi Desert Challenge, as Raed Baker rolled his Mitsubishi during the early stages of the day. He and co-pilot Nabil Ahmadi both suffered back injuries and were evacuated from the Liwa desert by helicopter, ending their rally campaign for this year. However, both are expected to make a full recovery.